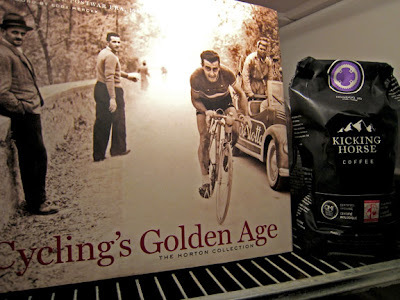 The chainring mixes well with the dark roast and book! I'm breaking from my usual favorite pairing of book & libation, and I believe a drink can be any thing you savour ... thus the coffee. The Horton collection is prominent in it's wonderful reminder of cycling memorabilia from Cycling's Golden Age. Coming from the dark period of World War II and into the new era of cycling. The riders' have become noble champions. Together with this fine coffee ... the stuff of legends! Coffee and cycling. What would make life sweeter? I can't think of it. I'm not in N. Van, but I will definitely check out Moja!